You are here: HomenextPlacesnextSchoolsnextFawcett School, York PlacenextClass 1A photographed in 1951? This is a photo of Class 1A Fawcett School. My brother, Norman, is the 2nd from the right in the 2nd row. I am fairly sure this picture would have been taken during 1951 as Norman would have been 11 years of age in that year. If you can recognise yourself or anyone else here, please leave a comment below. Click on the photo to open a large version in a new window. Definitely 1951/2 depending on when in the term it was taken. That’s me third row up and second in from the right with the Dandy stuffed in my jacket and next to me in the light jumper was John Smith and holding the placard I think is Peter (?) Hepworth. Other names that come to me are Packham, Blacker, Palmer, Claridge, Thorne, Holt and Watling The boy in the back 2nd from the right was named Cowley, who was always top of the class. If it is Mick Holt (1st row 2nd from the left) he has been a contributer to this site regarding Fawcett School and may be able to name some more. My brother Norman has Identified, to the best of his memory, more of the pupils in the photograph -they are from L-R starting with the back row (Note. N/K – Not Known) 1. N/K 2. Packham 3. John ? 4. Beale 5. Blacker 6. Richard Rye 7. Cowley 8. N/K 3rd Row 1. Brian Skinner 2. Ian McKechnie 3. N/K 4. N/K 5. Brian Streeter 6. Ray Castle 7. John Smith 8. Peter Barnard 9. Peter Reeve 2nd Row 1. N/K 2. Michael Arrow 3. John Hall 4. N/K 5. N/K 6. N/K 7. Michael Moore 8. Norman Searle 9. N/K 1st Row 1. N/K 2. N/K 3. Goldsmith 4. Peter Hepworth 5. Gillingham 6. White 7. Mitchell. Peter Goldsmith, 3rd from the left, front row seated, sadly died in 1963 aged 24. Top row, far left – that’s meeeee! Top row left, is my big brother Tony Duke. Yes, that is me, Mike Holt, second from left in the front row. 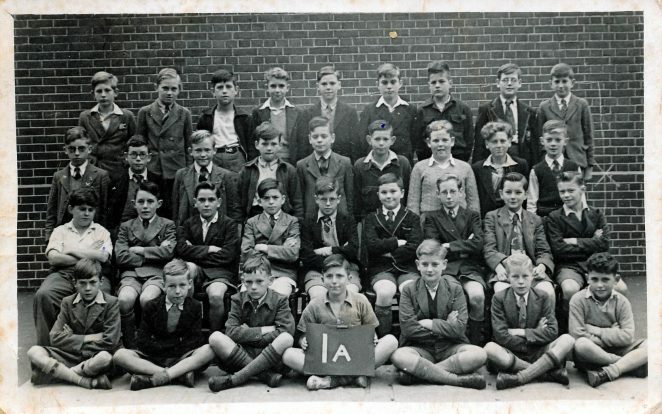 The boy sitting on the chair far left in second row is Roy Gravett.